Majlis-e-Ittehadul Muslimeen (MIM) President Asaduddin Owaisi on Monday filed the nomination for the Hyderabad Lok Sabha seat. A couple of hours after the poll process began with the issue of notification by election authorities, the outgoing MP from Hyderabad filed his papers before Returning Officer K. Manicka Raj, the Hyderabad District Collector. Taking everyone by surprise, Owaisi along with his party’s senior leader and MLA Ahmed Pasha Khadri reached the District Collector’s office and filed his nomination. “Alhamdulilah, filed my nomination papers today. Hyderabad Parliamentary Constituency has been the voice of India’s impoverished, oppressed and weak. Inshallah, it will continue to be so,” tweeted Owaisi. 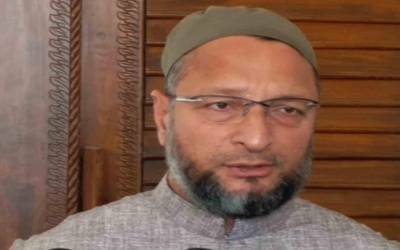 The MIM leader is seeking re-election from Hyderabad for a fourth consecutive term. The parliamentary constituency has been a MIM stronghold for over three decades. His father Sultan Salahuddin Owaisi represented the constituency and was elected for six consecutive terms from 1984 to 2004. Be the first to comment on "Owaisi files nomination for 4th term from Hyderabad"